It used to be that, if you had the good sense to want a metronome, you drove/walked/took the bus/hailed a cab/asked your mom for ride down to the local music store. Once there, you paid kind of a lot of money for one––let’s say $30 for one with circuitry, or $80+ for one with a spring, winder, and pendulum. You brought it home, unboxed it, tried using it, and were promptly humbled and/or discouraged. If you were like me, you repeated this process several times in the hopes that––just maybe––a different make & model of metronome would be easier or more inspiring to use. I’ve probably dropped $150 on metronomes in my life. These days, the best metronome in the world costs no more than a decent cup of coffee. From anywhere there’s wifi or cell signal, you can summon it directly to a device you already carry with you everywhere you go. control it all with a bluetooth pedal while onstage. But of course all this functionality comes with at least some sort of learning curve. 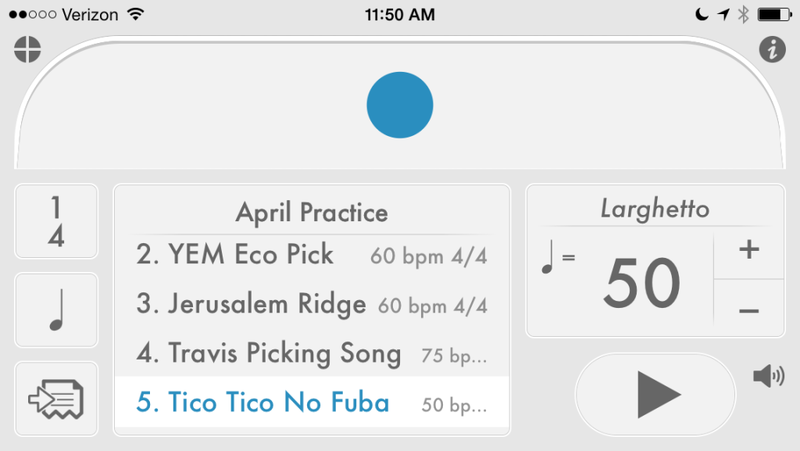 Thankfully with the Tempo app that learning curve is mercifully gentle and includes no small amount of hand-holding should you want it. We’re going to be using Tempo everyday for two weeks the foreseeable future, so I want to make sure we’re all on the same page. If you’re on iOS, you’ll find the app here. If you’re on Android, you’ll find it here. If you’re on a different platform, it’s 100% worth asking around to see if anyone you know has an old phone or iPod Touch lying around unused that you might press into service as a metronome. All the screen shots that follow are from an iPhone 5. 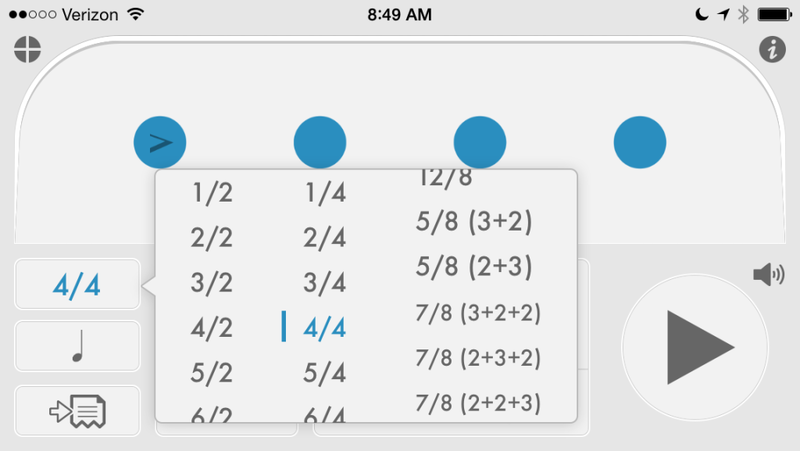 The app looks and behaves a little differently on tablets and on Android, but you should be able to get the job done no matter which device you’re on. 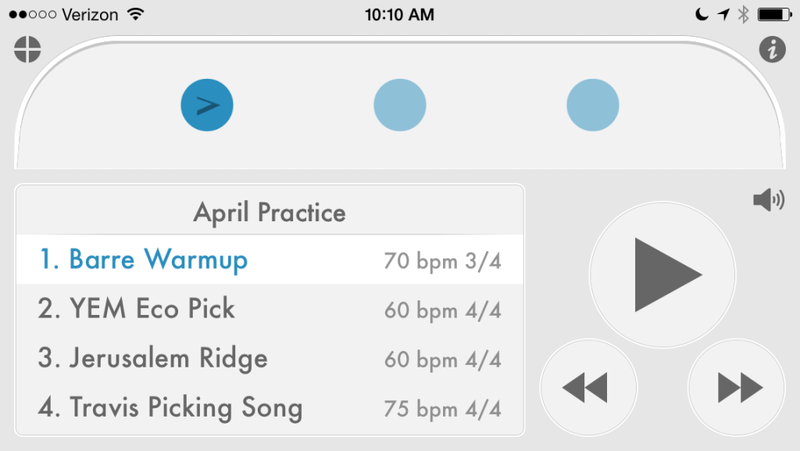 You can also get the job done with Pro Metronome, but obviously these screen shots won’t be of any help to you. In the upper right of the screen you’ll see a little i. Click that to pull up the settings menu. 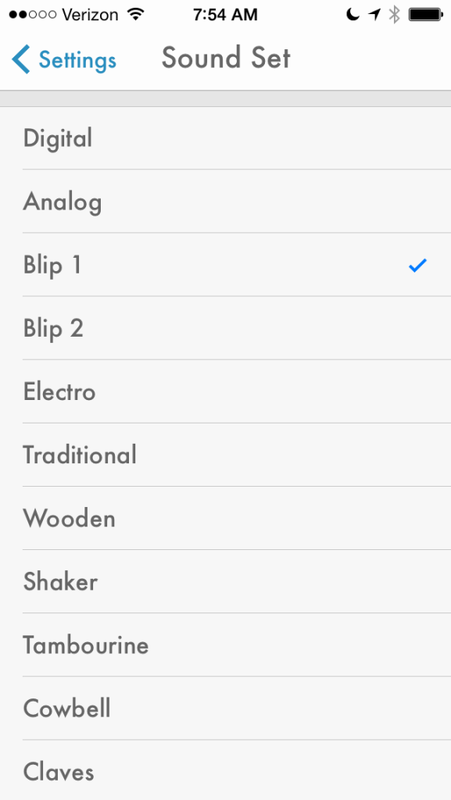 Under Sound > Sound Set, select “Blip 1.” This sound is my personal favorite, and the closest to the click sound in the most popular recording software (GarageBand, Logic, ProTools, etc). If for some reason you can’t stand Blip 1, “Pro” is also nice, and “Blip 2” is what we use onstage with the touring band. 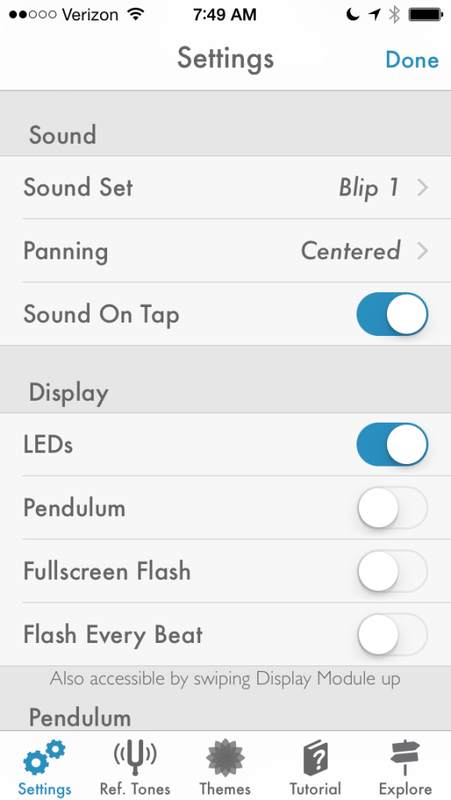 Click the little < Settings to head back to the previous screen and on the little bar along the bottom, select Themes. As you can see, we’re using the Flat/Light setting here, but I wanted to point out that on a dark stage (or maybe you practice in a dark room? ), you’d be better off with one of the darker options. Pick what you will, and then click Done in the upper left, which will send you back out to the main screen. No surprise here, the play button starts the click (and turns into the stop button). There are so many ways to adjust how fast the click goes, but if you’re anything like me, you’ll probably find a favorite or two and use them to the exclusion of all others. 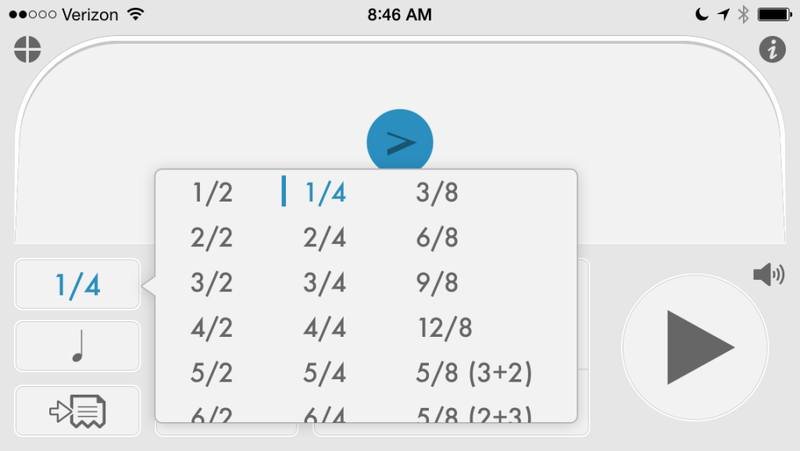 You can click the + and – to adjust in increments of 1. 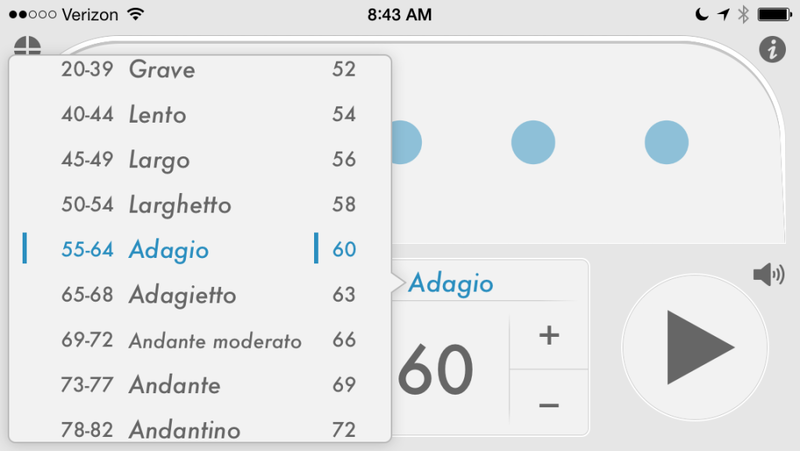 You can press and hold the + and – to adjust in increments of 10. You can tap your finger on the numerical display in time with the music to set via tap tempo. 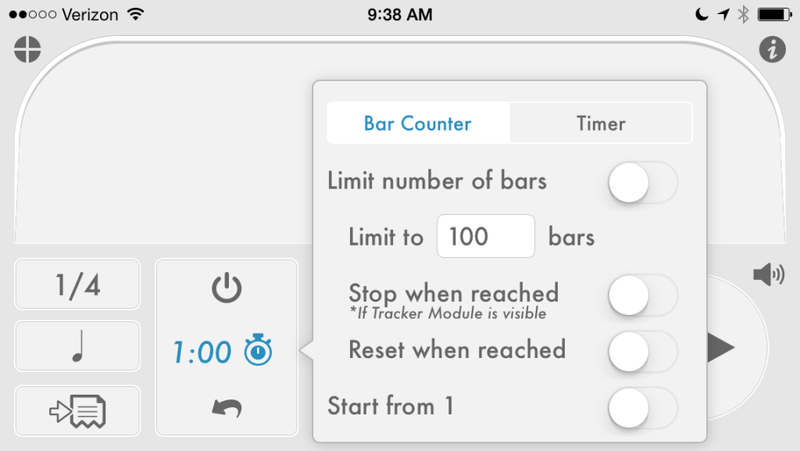 You can touch that numerical display and drag up or down. You can flick the Italian tempo ranges left or right. 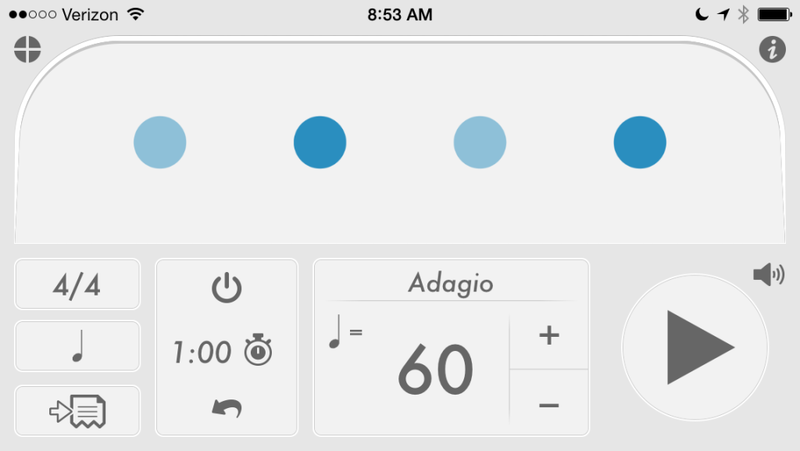 Or you can tap that same bar to see the full range of Italian tempo markings. 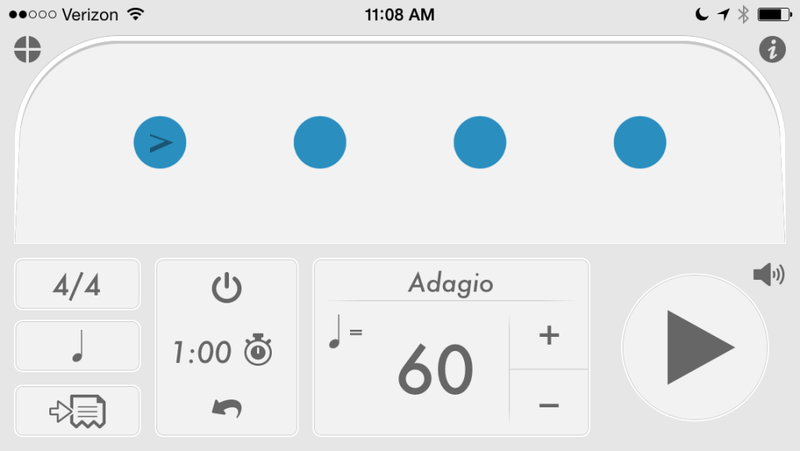 If you click on the little fraction, you’ll see a list of time signatures or meters. We’ll stick exclusively to that center column (the ones with a denominator of 4), and I’d honestly be surprised if you get much use out of some of those more exotic ones (like 13/2). Just for illustration’s sake, select 4/4 from the list. Then click anywhere to dismiss that window. Now you have four separate LEDs, with just the first beat accented. Hit play to give that a listen. 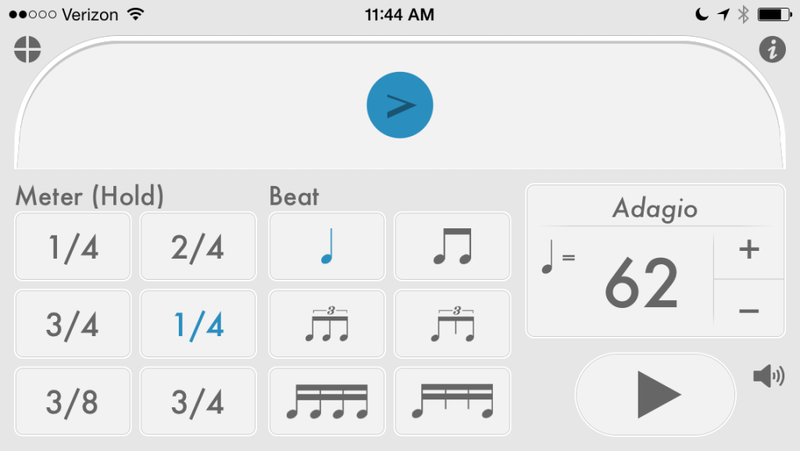 You can see how having the first beat accented might come in handy in keeping your place in the music, or keeping you honest when sight reading, or any number of other uses. You can also adjust each individual LED’s sound, so you might choose to make beats 1 & 3 silent, leaving just the “back beat” on 2 & 4. In fact, try that now, and give it a listen. This whole click-on-two-and-four is something we’ll be doing later in this course, and it’s the preferred click setup for jazz, R & B, and anything else that ought to groove. As you might imagine, getting used to hearing the click on 2 & 4 has a pretty steep learning curve, so this sort of silent-but-visible training wheels is pretty damned helpful. Go ahead and switch back to 1/4. If you click on the little quarter note icon, you’ll get some different options for dividing the beat. Click on the eighth notes, and tap anywhere to dismiss that window. Hit play and give that a listen. 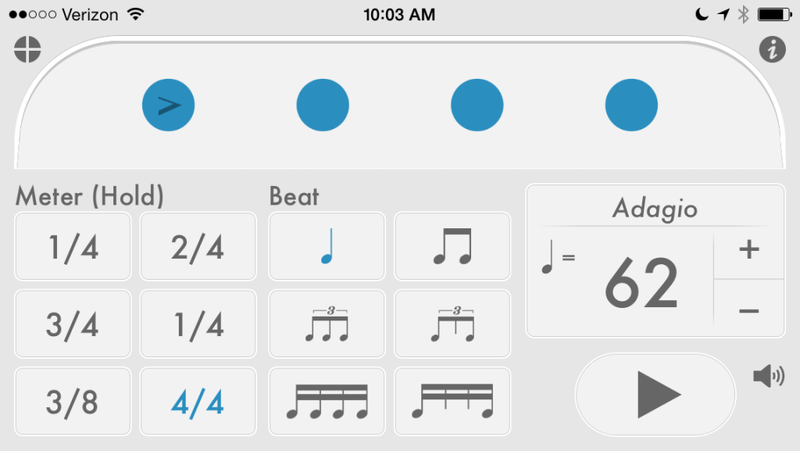 In between each beat (quarter note), there’s now a division (an eighth note). With the LED set to accent (>), the beat and the division sound different. Tap that LED though, and they’ll both sound the same. There are instances where both of these are quite useful, and we’ll explore them in greater depth later on this week. For now, switch the division back to the quarter note. 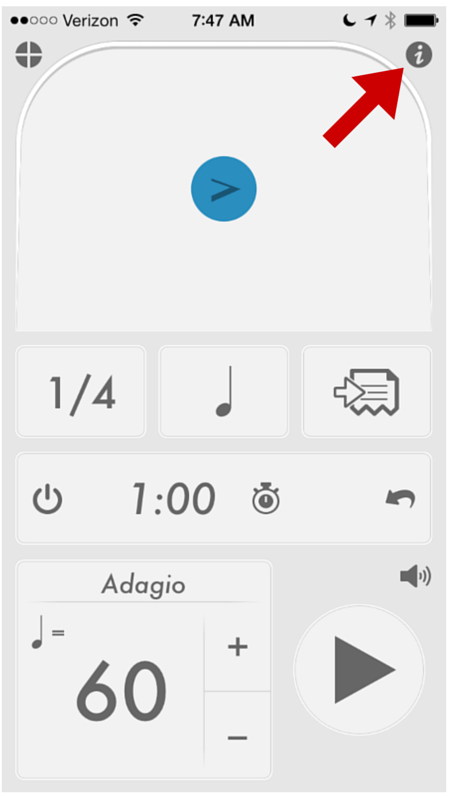 Below the beat icon is the icon for saving a song. 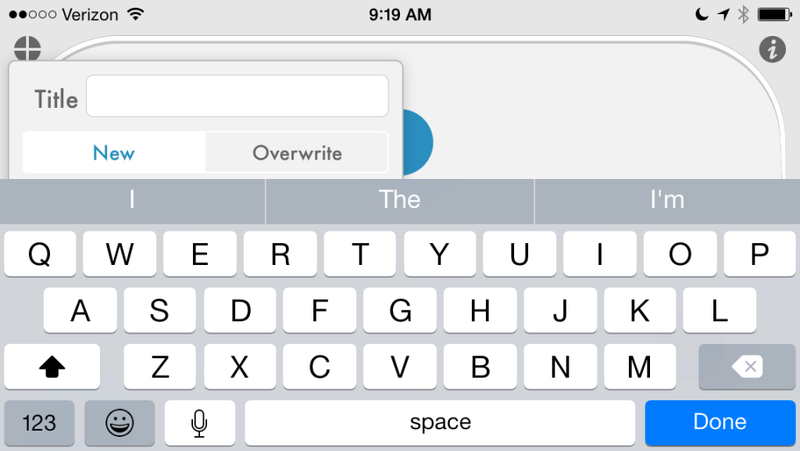 If you hit that button, the keyboard pops up so you can name it. When you hit Done, it takes you back to the main screen. In the Interface Mode we’re currently in (more on Interface Modes in a moment), the name of the song isn’t displayed, so there’s no real confirmation that what we just did worked (but I assure you it did). If you’re on a particular song and you make changes that you’d like to save (for instance, you decide that that song ought to be at 62 bpm instead of 60), just hit that button again. Now tap the Overwrite button, and the name of the song you’ve edited pops up and you can save your changes over the previous version. Sadly, the Tracker is iOS only. I highly recommend getting a kitchen timer. 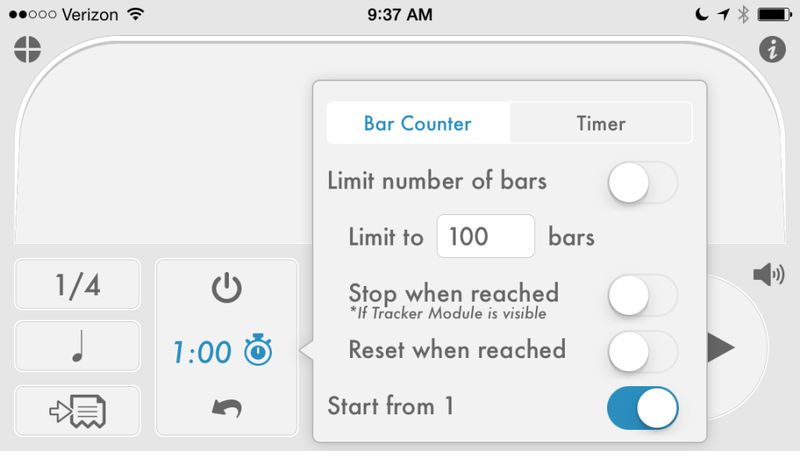 You can also set Tempo to count either bars or minutes (and seconds). Tap this section to see your options. Under the Bar Counter heading you can ask Tempo to count up a certain number of bars, then stop clicking and reset the count. Or limit how high the count goes, but don’t stop, and don’t reset. 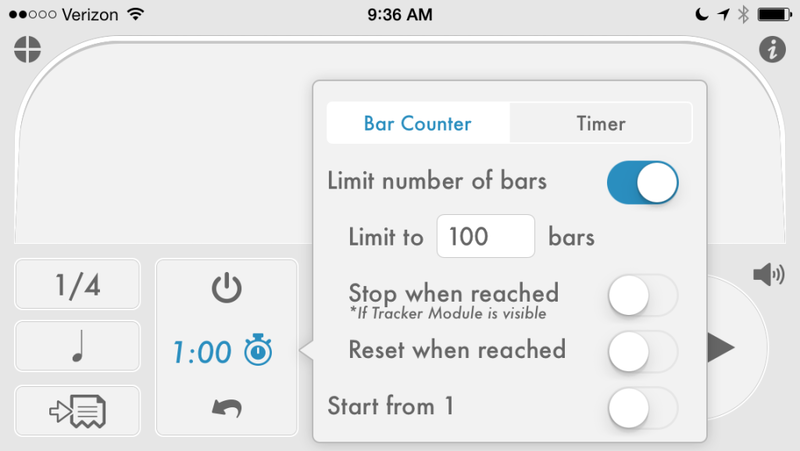 Or you could turn off Limit number of bars just to see how long something is, or maybe how many times you’ve practiced it. 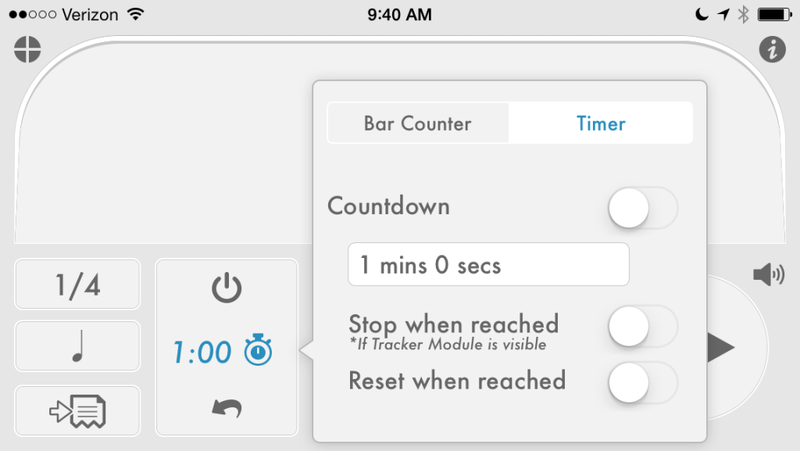 All that said, we’ll be using the Tracker mostly for its timer. We’ll adjust how much time on a case-by-case basis. 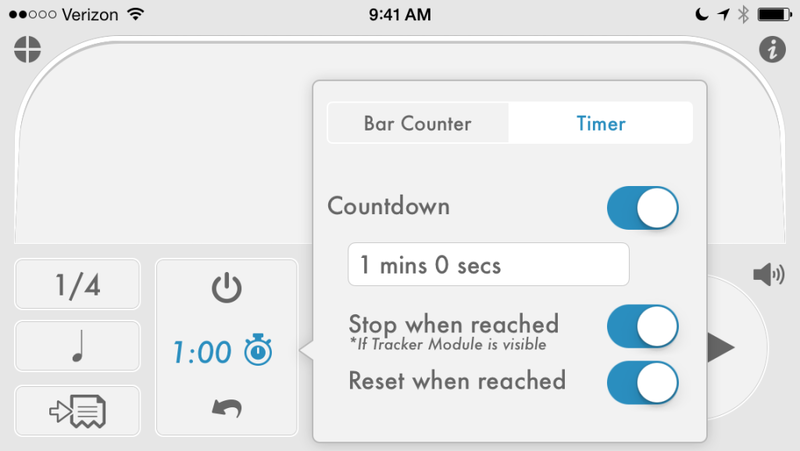 Hit done to set the time, then tap anywhere to dismiss the Tracker window. Once you have all of that set, you’ll still need to turn the Tracker on. 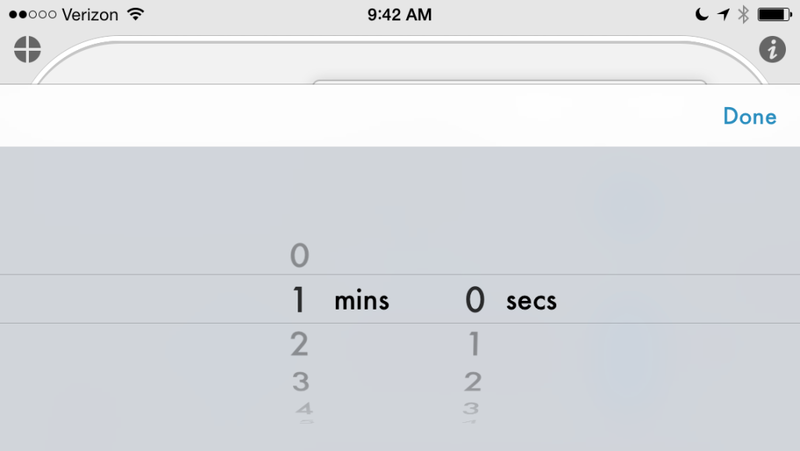 If for any reason you need to reset the timer, just tap this little button. Something to keep in mind is that the Tracker settings are global, so they aren’t saved as part of your songs. 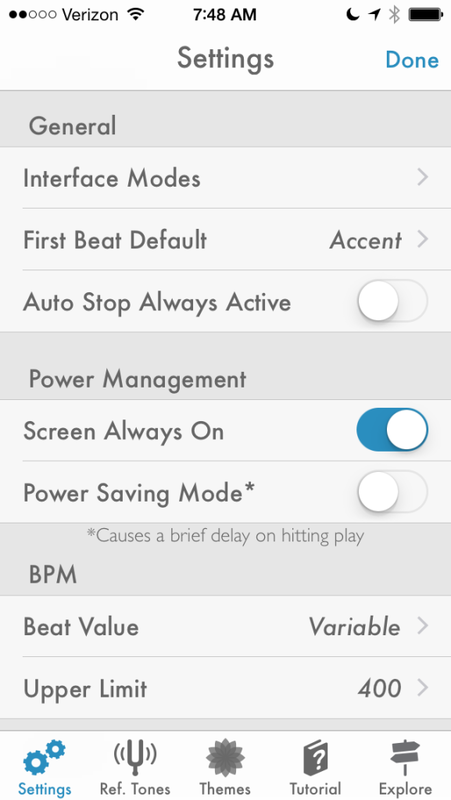 As you’re about to see in Interface Modes, this also prevents the timer from turning off the click mid-performance. Interface modes are also iOS-only. Android gives you everything (well, except for the aforementioned Tracker) on one screen and calls it a day. So far, we’ve been using Tempo exclusively in Basic mode, but there are others you’ll want to access depending on how you’re using the app from moment to moment. 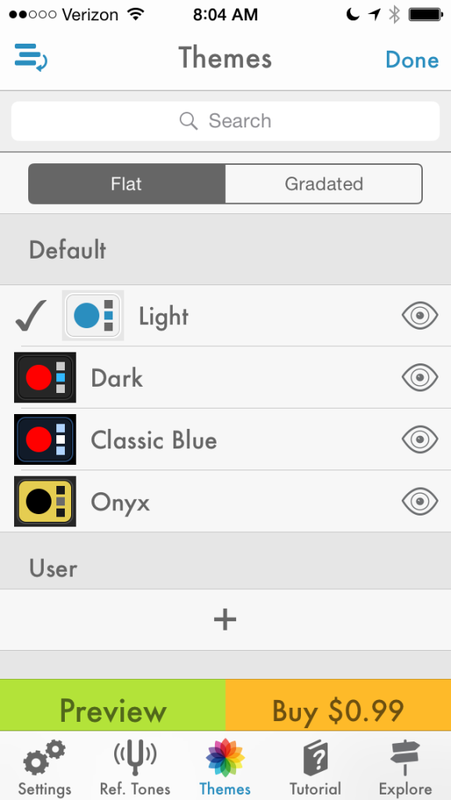 To see the other modes, click here in the upper left. 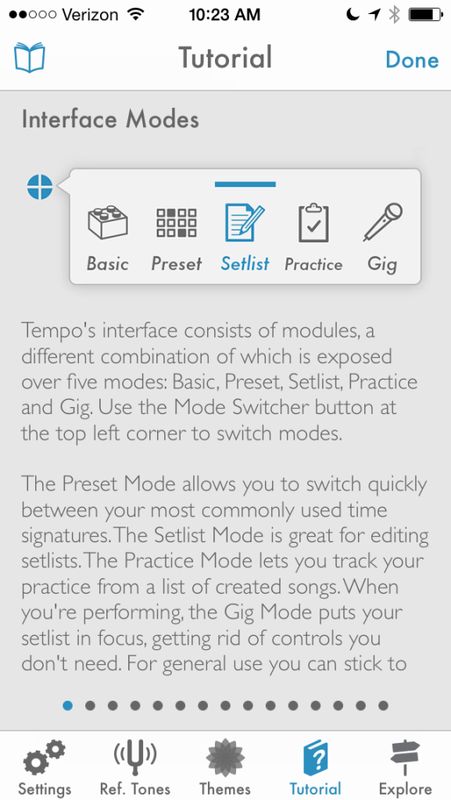 Preset Mode gives you first-layer access to Meters & Beats, but hides saving functions & the Tracker. If there are particular time signatures you use often, you can assign them to those six tiles by holding on one. 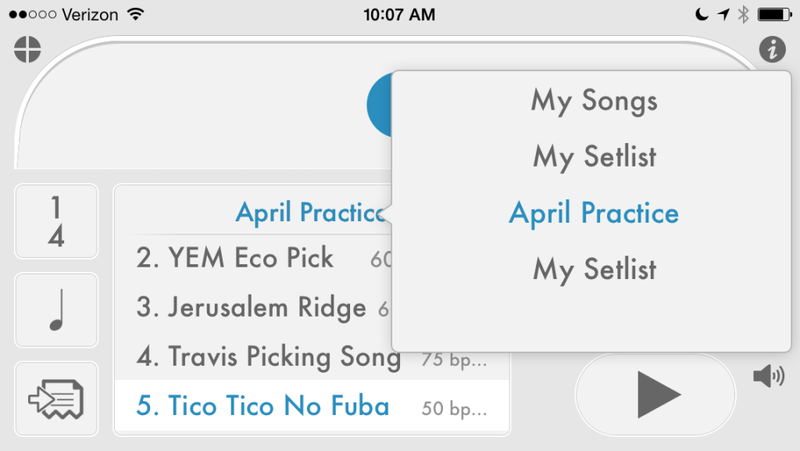 Setlist Mode hides the Tracker in favor of displaying the songs in your current setlist and the things you need to edit them. You can switch between setlists by tapping on the setlist title. Practice Mode hides the Beat, Meter, & Saving buttons, but gives you back your Tracker. 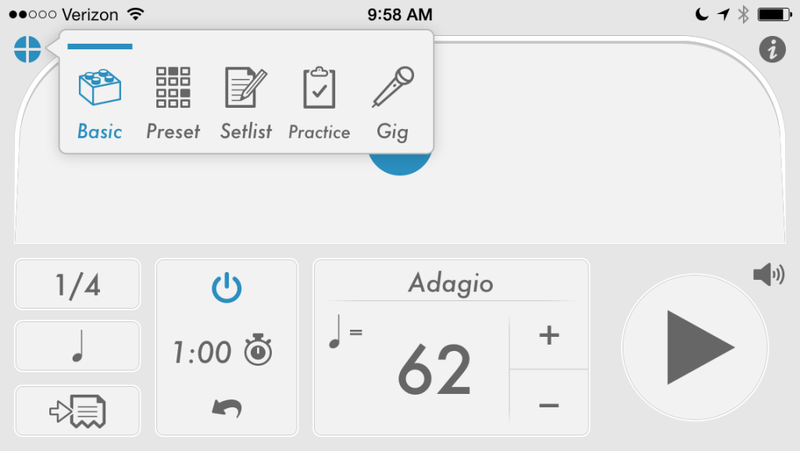 Gig Mode hides everything you won’t need while performing to make more room for what you will need: a bigger version of the setlist, a bigger play/stop button, and forward/back buttons for switching between songs. I’ve buried you under an avalanche of words and screen caps, and we are nowhere near covering every single thing this app can do. Luckily for you, we don’t need to learn it all in one go (or ever, really). On top of that, the guy who designed it was smart enough to be agnostic about how people would use it, so it’s super powerful when that’s what you need, and dead simple to use when you don’t. He was also kind enough to provide a detailed tutorial that you can find by clicking the little i in the upper righthand corner, then selecting Tutorial in the menu bar along the bottom. 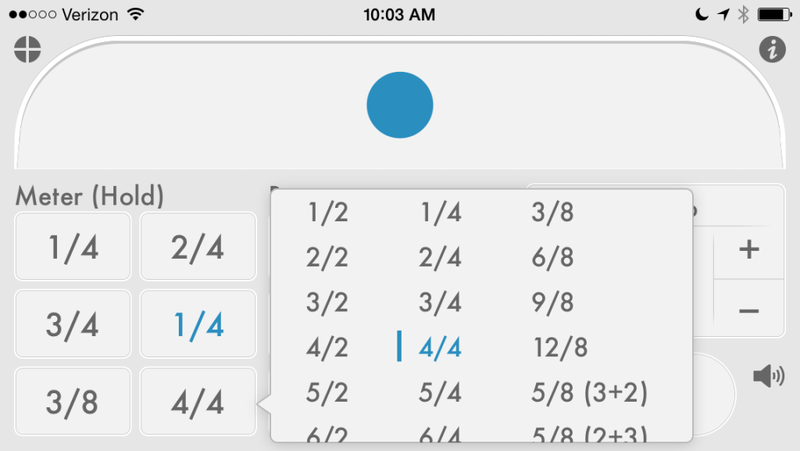 Take a few minutes today to play around inside the app and familiarize yourself with its basic functionality. We’ll be using it every day for the next two weeks, after which I hope you’ll continue using it every day until such time that we all have metronomes embedded in nanochips inside of our ear hair. Also, if this sort of thing (apps that is, not fictional technology in your ear hair) intimidates you instead of excites you, don’t worry about it. 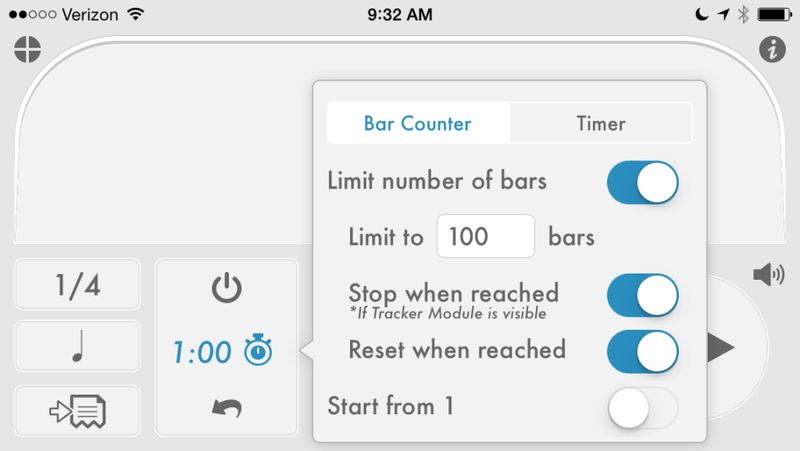 For the duration of the course, every time I ask you to do something more complicated than adjust tempo or set the timer for x minutes, I’m going to assume that you’ve completely forgotten how to do that, and I’ll provide you with the same sort of screen shots I’ve provided here.